While the challenges and difficulties cannot be avoided entirely, it is almost always possible to make the lives of people with visual impairment more comfortable and less stressful. Increased awareness is key to this, as is an understanding among professionals of how to support independence and occupational performance in the home in the practical and realistic ways. Visual impairment is classed as a limitation of one or more of the functions of the eye or visual system that inhibits vision or visual field and acuity, and cannot be corrected with standard glasses or contact lenses. Within this definition, people can be registered as either sight impaired, which was previously known as “partially sighted”, or severely sight impaired, which was previously termed “Blind”. Even with these two specific terms, the classification of visual impairment remains extremely broad as sight loss is something that can be experienced in radically different ways from one individual to the next. Moreover, there are many causes of sight loss. The leading conditions include-related macular degeneration, glaucoma, cataract and diabetic retinopathy, which are eye-specific ailments. Beyond these, vision can be impaired by other conditions that are not directly associated with the eye itself and instead lead to neurological damage. These disorders include stroke, motor neurone disease and Parkinson’s disease. 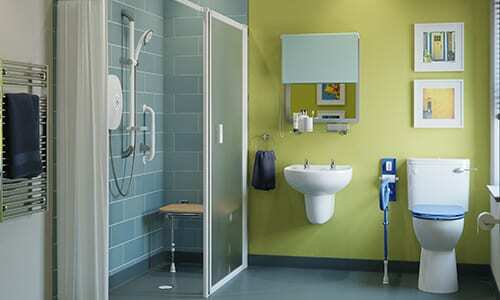 Why is it important to adapt bathrooms for the visually impaired? 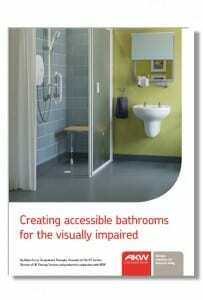 Enhancing independence and safety at home is critical for those living with visual impairment. A fall in the bathroom can have severe psychological consequences on top of the physical injury and can lead to individuals becoming extremely fearful of their own home. The resulting inactivity and isolation can substantially damage wellbeing and health, and restoring confidence can take a great deal of work and time. The enormous impact can also be witnesses in society as a whole as falls associated with sight loss cost the NHS £25.1 million every year. While this sum is already great, it looks set to grow further because the number of people living with visual impairment is predicted to increase in the coming years, due to both the rapidly ageing population and the rising incidence of some of the causes of visual problems, such as obesity and diabetes. Experts estimate that more than 2,250,000 people in the UK will experience visual impairment by 2020, with that number expected to be higher than 2,880,000 by 2030 and nearly 4,000,000 by 2050.